“The Man Who Would Be King and Other Short Stories" (1888) is a novella by Rudyard Kipling. John Huston admired and knew all Kipling‘s poems and novels. We can understand why he was so determined to transfer the novel to the screen. 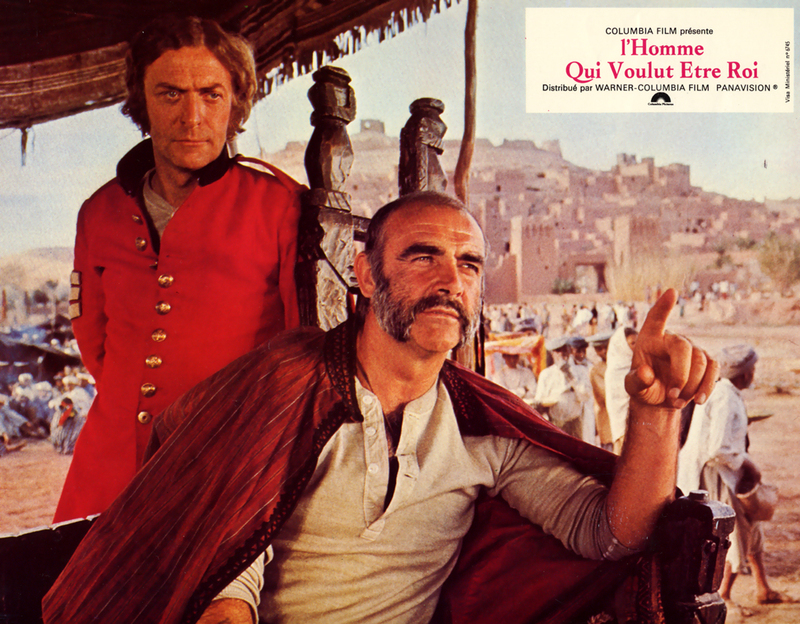 The Story : Daniel Dravot (Sir Sean Connery) and Peachy Carnahan (Sir Michael Caine), two ex–soldiers resign from the British colonial Army of India. They meet a British journalist Rudyard Kipling, that stops them from blackmailing a minor rajah. After that funny episode, they go off to Kafiristan (Afghanistan ?) to become kings and get money from the natives. 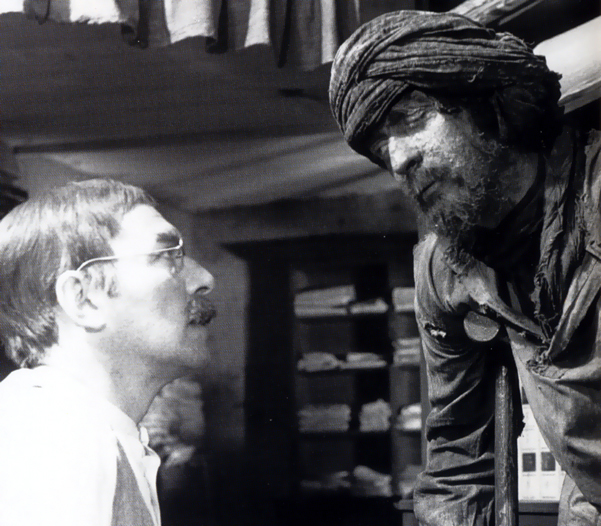 Two years later, Carnahan, a crippled beggar, came back to India and tell their amazing story to Rudyard Kipling (Christopher Plummer). Because of their modern military knowledge and equipment, they succeed to muster an army, then take over villages and dream to build an unified nation. They are both acclaimed as gods and Daniel Dravot is declared the immortal son of Alexander the Great by the Kafiristanis, the native countrymen. But soon, their schemes are dashed. Dravot is killed and Carnehan is crucified but he survives and the Kafiristanis free him. The director wrote the final screenplay version with Gladys Hill who was also his long-time assistant. He respected the novel very closely, so an extent that when reading the book you could have the feeling that the screenplay of the movie is a straight copy of the book with the exception that Huston has included in his screenplay Rudyard Kipling as an actual character whereas in the novel he is just the narrator. Also, compared with the book Huston cut the epilogue of the story (Peachy Carnahan’s character died in a Poorhouse). The veteran director took more twenty years to complete it. Originally, Clark Gable and Humphrey Bogart were the first choice. But, in 1957 Bogart died and Gable three years later. Other actors were considered to portray the Two British soldiers. In 1974, Huston was finally able to obtain the money with the help of the producer John Foreman (“Butch Cassidy and the Sundance Kid” (1969) ; “The Life and Times of Judge Roy Bean” (1972) ; “The (First) Great Train Robbery” (1978)). Because of the success of “Butch Cassidy and the Sundance Kidd” (1969) the producer first considered Robert Redford and Paul Newman. Despite a very good script, Newman had the feeling that he wasn’t the right choice and advised Huston that British actors should be better for playing the roles. Finally, Sir Michael Caine and Sir Sean Connery took the leading parts. Like for “Lord Jim” (see the topic), Columbia Picture accepted to distribute and co-produce the movie ($8 million). The distinguished Canadian origin actor, Christopher Plummer (“Royal Hunt of The Sun” (1969) ; “Waterloo” (1970) ; “Hanover Street” (1979) ; “Somewhere in Time” (1980)) was considered to portray Rudyard Kipling. The gorgeous Shakira Caine, Sir Michael Caine’s Wife, complete the outstanding cast to play the part of Roxanne. The Producers asked for the collaboration of the cinematography Oswald Morris (“The Roots of Heaven” (1958) ; “Sleuth” (1972)). The talented Production Designer, Alexander Trauner (“The Apartment” (1960) ; “The Private Life of Sherlock Holmes” (1970)) and the acclaimed Costume designer Edith Head ((“Willie Boy” (1969) ; “The Life and Times of Judge Roy Bean” (1972)) were chose to join the technical crew. 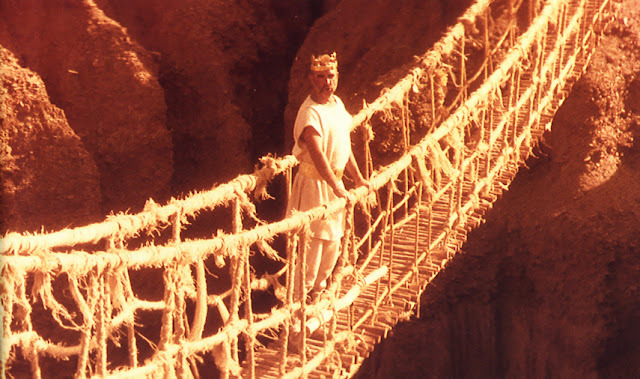 The film was shot in Panavision / Technicolor at Pinewood Studios and at locations in France (Chamonix), Morocco (kasbah of Ait Benhaddou) and the USA. 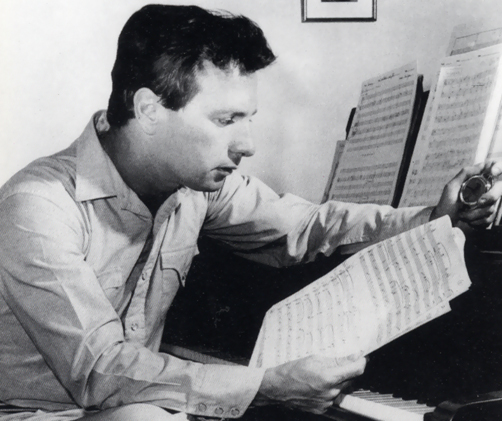 It was the third time that the French origin composer, Maurice Jarre scored a John Huston‘s movie (“The Life and Times of Judge Roy Bean” (1972) ; “The Mackintosh Man” (1973)). He wrote the complete score in one month and recorded it in London with the help of The National Philharmonic Orchestra and of six Indian musicians during two weeks. John Huston was very happy with the result. Jarre succeeded to merge ethnic instruments (sarangi and sarod) with a large symphonic orchestra together with the traditional hymn “The Minstrel Boy” which was the recurrent song in the movie. The three actors gave a tremendous performance and they considered the filming of this movie as the happiest professional experience in their career. At every minute, it is a joy to see them on the screen. With Maurice Jarre, they kept a very emotional memory about their collaboration with the legendary director. 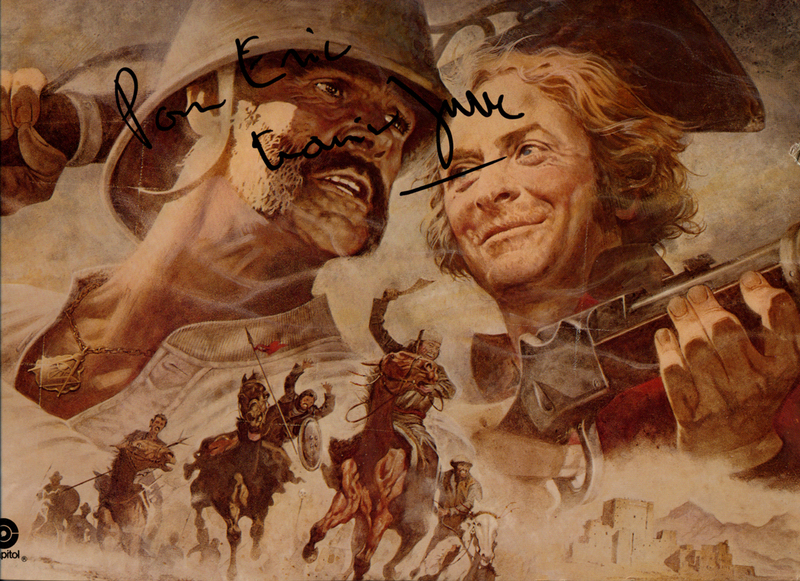 In 1983, the American Film Institute celebrated the John Huston’s career, Sir Michael Caine was here and remembered the memorable shooting of the movie. 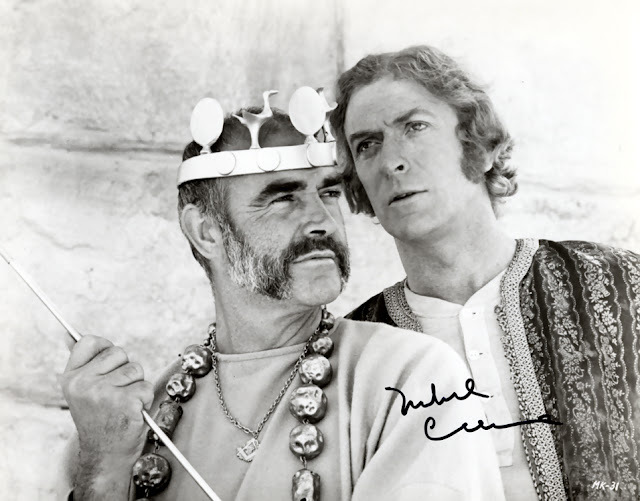 He talked the time when Connery and him, visited Huston at the cedars Sinai Medical Center in Los Angeles. They admired so much Huston’s personality that they recreated the funny scene of the military walk they had devised for the film. With a great emotion, the old illness man said “Danny and Peachy have come to see me”. Fortunately, Huston recovered and made other wonderful films until 1987. The movie received good responses from the audience and a lot of critics praised it. It was nominated for four Academy Awards (Best Art Direction - Alexander Trauner, Tony Inglis, Peter James ; Best Writing - John Huston, Gladys Hill ; Best Costume Design - Edith Head ). “John Huston” by Patrick Brion (in French) ; 2003 ; Edition de la Martinière, France. “John Huston” by Robert Benayoun (in French) ; 1985 ; Edition Pierre Lherminier, France. “The Great Adventure Films” by Tony Thomas “(In English) ; 1976 ; Citadel Press Book, USA. “What Is all About ?” by Michael Caine (In English) ; 1992 ; Turtle By Books, USA. “Michael Caine : The Elephant to Hollywood” by Michael Caine (In English); 2011 ; Hodder & Stoughton ; UK. “Sir Michael Caine : The Autobiography” by William Hall (In English) ; 2007 ; Metro / John Blake Publishing, UK. “Michael Caine : A Class Act” by Christopher Bray (In English) ; 2006 ; Faber and Faber, UK. “The Films of Sean Connery “ by Lee Pfeiffer and Philip Lisa (In English); 1997 ; Citadel Press Book, USA. “Sean Connery” by Jean–Jacques Dupuis (In French) ; 1986 ; Artefact Henri Veyrier, France. CD Album of “The Man Who Would Be King” by Maurice Jarre ; Bay Cities / BCD 3007.